How does the ARM architecture differ from x86? The core difference between those in this aspect is that ARM instructions operate only on registers with a few instructions for loading and saving data from / to memory while x86 can operate on directly memory as well. Up until v8 ARM was a native 32 bit architecture, favoring four byte operations over others. So ARM is a simpler architecture, leading to small silicon area and lots of power save features while x86 becoming a power beast in terms of both power consumption and production. 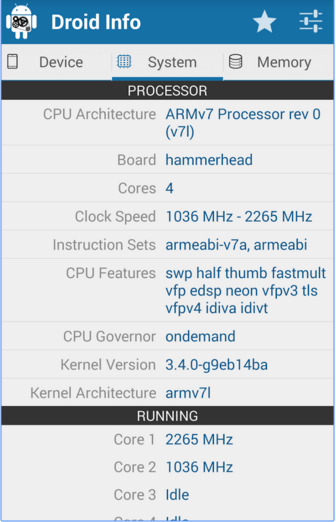 How to check which of the Processor, ARM, ARM64 or x86, powers your smartphone? To know the CPU architecture, first you’ll need to install an app that details you about the hardware available in the smartphone. The best app for the purpose is the one called ‘Droid Hardware Info’. You can click here to get to the install page directly. 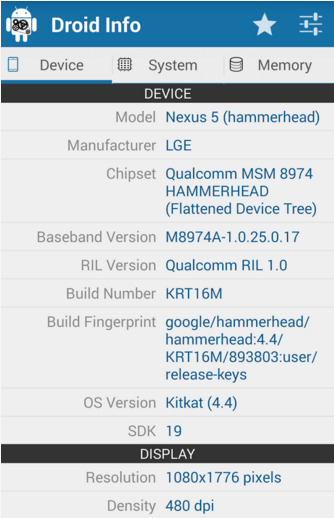 Once the app is downloaded, open Droid Hardware Info and move to the System tab. Here you’ll be shown various details of your hardware, however just two of them will be of your concern – CPU Architecture and Instruction Sets. Note down this information on a piece of paper and then you can move on the next step. Unfortunately, the information available in the CPU Architecture and Instruction Sets section are not identical to the one you’ll find in Xposed Installer, or other apps for that matter. But that doesn’t mean you wont be able to figure out the required details. What you need to do now is simply match the information you noted earlier with the table we have provided below. This will then get you the common name of your handset’s CPU type. That is all guys, now you can head on an install apps like Xposed Framework with the right information in your hands. Best of luck.